Today was a transition day from coffee (last week's theme) to confection. Welcome to Day #1 of Chocolate and Toffee Theme Week. 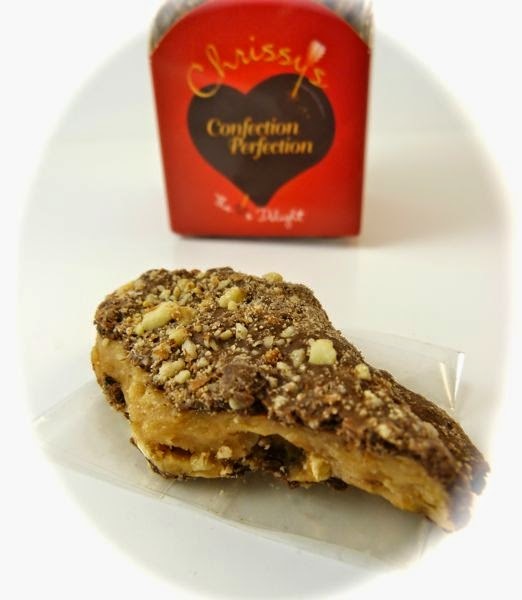 I love nuts and chocolate, and this piece of Coffee Toffee from Chrissy's Confection Perfection was loaded with macadamia nuts inside, and coated with almonds on the outside. Covered in dark, semi-sweet Guittard chocolate and "dusted with a fine grind of premium dark roast coffee," this flavorful, gluten-free toffee was pretty all around wonderful. Flavors and textures were bold and well balanced, and the thick toffee was sweet without being overly so. As with any brittle, maximize crunchiness by eating this Coffee toffee (made with no preservatives) while it's fresh. Later in the evening, I had the good fortune to attend an exhibit ("Welcome to Fogland," with beautiful atmospheric photos by S. Kane) in San Francisco. 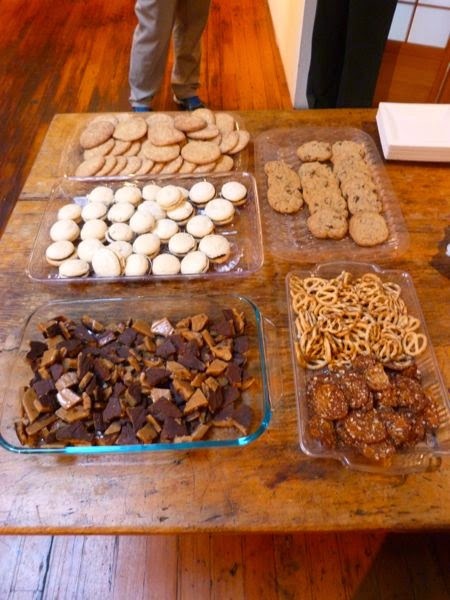 As part of the opening celebration, a friend (Victoria) had made cookies and toffee for the event. The cookies included fresh lemon curd and Mexican chocolate filled macarons (delicious) and a tray of homemade toffee (also wonderful). I'm including a picture here. It was a true Chocolate Banquet day. Thank you Victoria. So glad you could come to the "Welcome to Fogland" reception and that you enjoyed it. And yes, Victoria is a baking goddess of small treats!